A close-up view, taken by Japan's Hinode spacecraft, of a plasma "bubble" forming in the sun's atmosphere. These bubbles can help feed huge solar storms known as coronal mass ejections. Super-hot bubbles of plasma feed powerful solar storms that can wreak havoc on Earth, a recent study suggests. These bubbles apparently rise through the sun's atmosphere, joining with giant "ropes" of magnetism and electric current higher up, researchers said. The injection of mass and magnetic flux causes these ropes to swell and then burst, resulting in a violent explosion called a coronal mass ejection (CME). Such explosions send huge clouds of charged particles streaking into space. When the clouds hit Earth, they can disrupt satellites and power grids, as well as pose a danger to astronauts on spacecraft. The study's results should help scientists better understand how such storms form, researchers said. 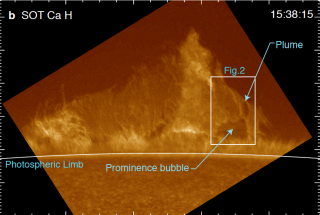 Further Hinode observations, along with data from SDO, determined that the bubbles were at least 450,000 degrees Fahrenheit (250,000 degrees Celsius), and more likely topped 1.8 million degrees F (1 million C). That makes the bubbles 25 to 100 times hotter than the material just above them, suggesting that they rise because of strong thermal buoyancy in addition to any magnetic effects, researchers said. The bubbles are thus "analogous to the blobs of material in a lava lamp that are heated by a light from below, become buoyant, and rise to the top to deposit their energy, then drop back down again," Berger said. The team therefore discovered a mechanism explaining how the solar "ropes" can grow in mass and magnetic flux — to the point that they overcome the "tethering" forces of overlying magnetic fields and explode in a powerful CME, researchers said. The team published its results in the April 14 issue of the journal Nature. After a three-year slumber of historic proportions, solar activity is starting to pick up again. The sun has already unleashed two X-class solar flares — the most powerful type — in 2011, including a Feb. 14 blast that was the strongest such eruption in more than four years. A huge CME in March also spawned some of the most spectacular northern lights displays in recent memory. Earth should be in for more such solar storms as the sun ramps up toward peak activity in 2013 or 2014, researchers say. And the new study might someday help scientists predict when a big CME might be coming our way — and how strong it could be.